Last weekend I planned a surprise getaway for Mike’s birthday. I wanted something close, something serene … somewhere we could just relax. 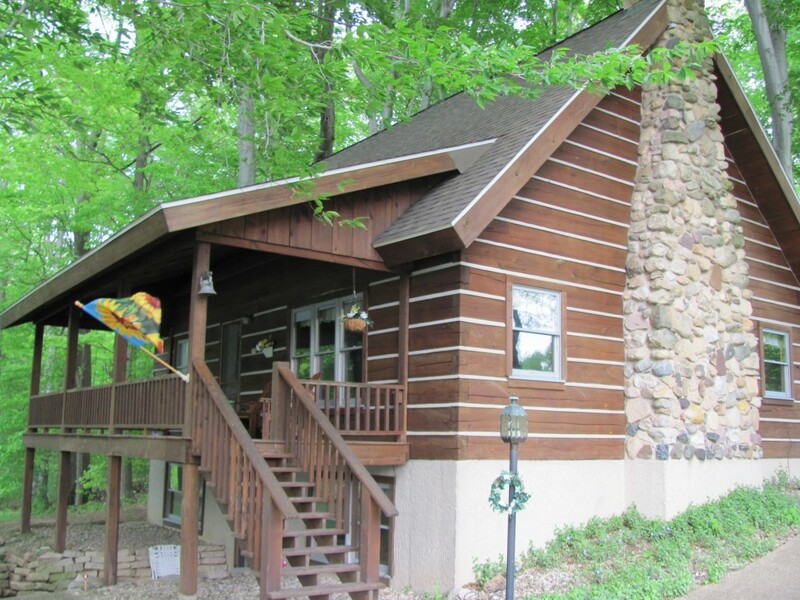 I found a secluded cabin just an hour and 15 minutes away from Chicago, nestled on 80 private acres of woodland and spring fed ponds. 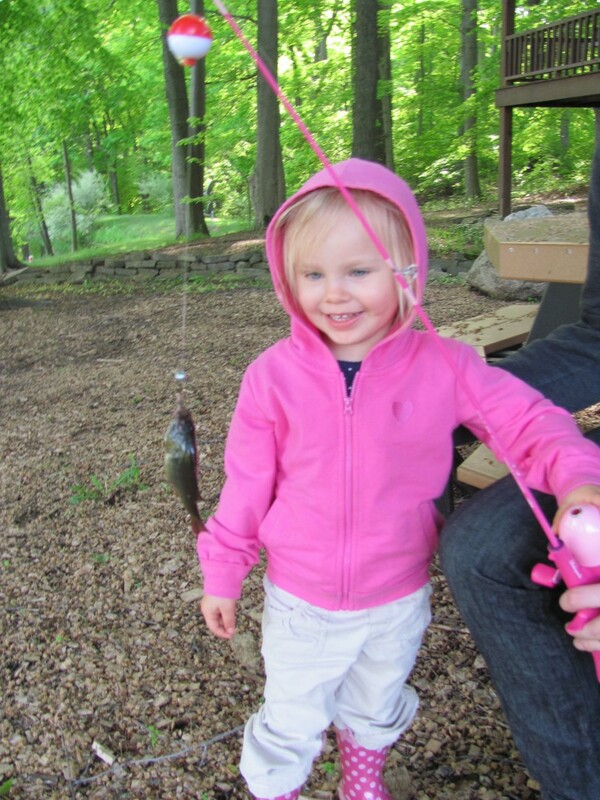 I did all the packing and grocery shopping in advance and even picked up two fishing poles [Mike has always wanted to take Ava fishing]. It is amazing how much stuff we had for just a two night/three day stay [most of it for Ava – kids don’t pack light!]. Mike drove us to our destination, guided by “Matilda” [the name we gave our mobile navigation voice] and was pleasantly surprised as we turned down the long private drive to the cabin. 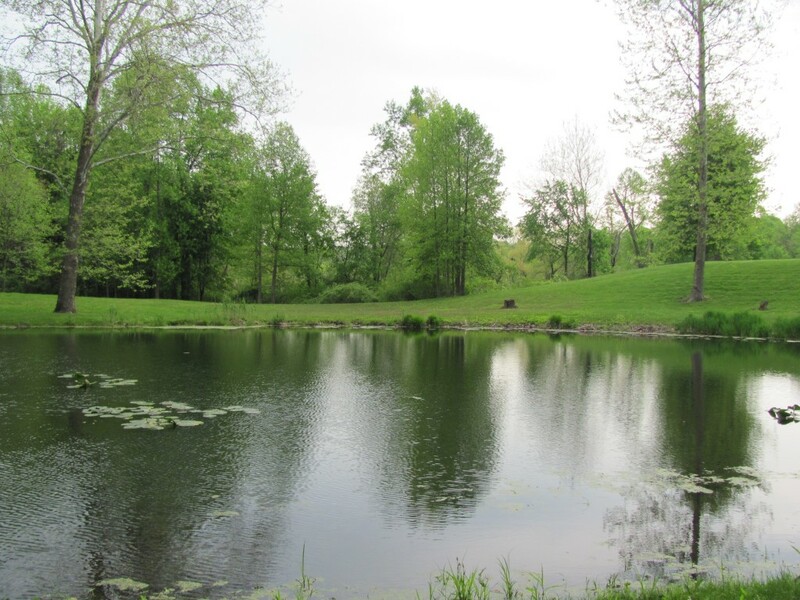 The surroundings were beautiful – lush spring forest, lily pad laden ponds – ahhhhh nature. While I sorted things out inside the cabin, Mike busted out the fishing poles and he and Ava dug up some worms and headed to the pond. She caught a baby bluegill on her first cast! She ended up catching a total of two … Mike, zero. We kicked off our night by making a fire in the firepit and roasting hot dogs and marshmallows. I thought Ava would love s’mores, but she said she didn’t like marshmallows “with brown stuff”. She did enjoy waving her marshmallow stick around though! On Saturday we went exploring [we were only 15 minutes away from the Michigan Harbor Towns on the beachfront] and picked up some local morels and sausages from a farmer’s market. 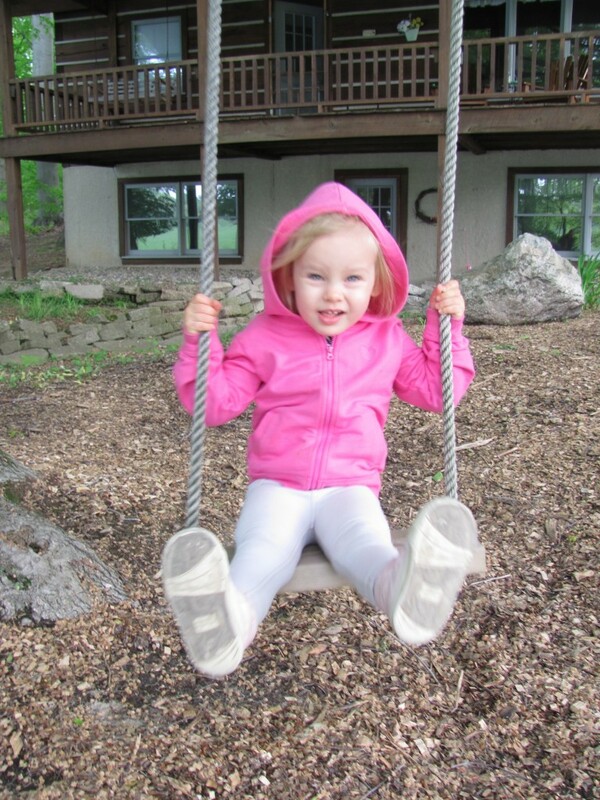 Ava spent lots of time outdoors and especially loved the tree swing out in front of the cabin. Saturday night, Mike and Ava headed down to one of the ponds with a flashlight and net and brought back a bullfrog and a tree frog. [If Ava spots a gnat or fly, she totally freaks out – but frogs and fish, love at first sight!] 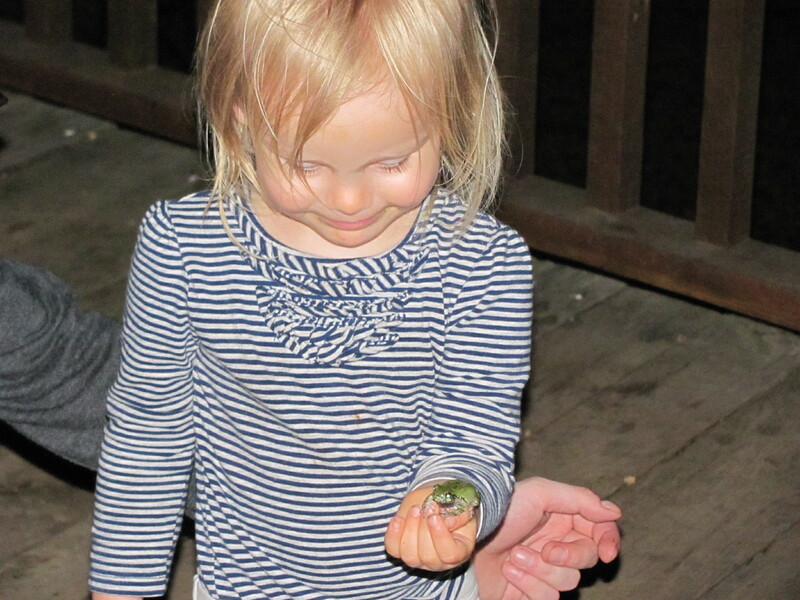 She held the treefrog for quite a while and wanted to bring him home with us [um no.]. The next morning, Mike made a stellar skillet breakfast using our fresh morels and some wild onions, scrambled eggs, local bacon, and potatoes. Yum. Then he and Ava headed down to the pond one last time and found a few tadpoles. [Not bringing those home either!] By the time we had to leave, we were just getting into the rhythm of cabin life [isn’t that how it always is on a vacation … just when you start to relax it’s time to go]. I have a feeling this won’t be our last weekend getaway for the spring/summer.